Pros: The Intex Explorer K2 is a value for money kayak with a number of features that allow you to get value for money. This kayak is great for lakes and low-tide seas as it is durable and withstand any small tides. With adjustable seats comfort is great, a really snug little kayak we fell in love with. Cons: As mentioned this kayak is great for lakes and low time seas however it is not great for on sea kayaking. We also recommend you buy some paddles as the ones that come with the Intex Explorer are not great. The Intex Explorer K2 kayak is a well designed two-person inflatable kayak. This beauty is ready to use as soon as you get it out of the box. The kayak, paddles, patch kit and Intex Double Quick II Hand Pump all fit into a convenient storage bag. With the light weight of this kit, it can easily be carried by one person from vehicle to water. The Intex Explorer K2 kayak was constructed to provide a relaxing water experience. It rides well in the water and, with its removable skegs, tracks very well in all water depths. Although it is designed and sold for use only on lakes and mild rivers, some users have reported success with the Intex Explorer K2 kayak on Class II and Class III rivers. You will need to keep in mind that the collapsible paddles are not designed for whitewater and will be the weakest part of kayaking on wilder rivers. The actual Intex Explorer K2 kayak is sturdy enough to survive rougher water. 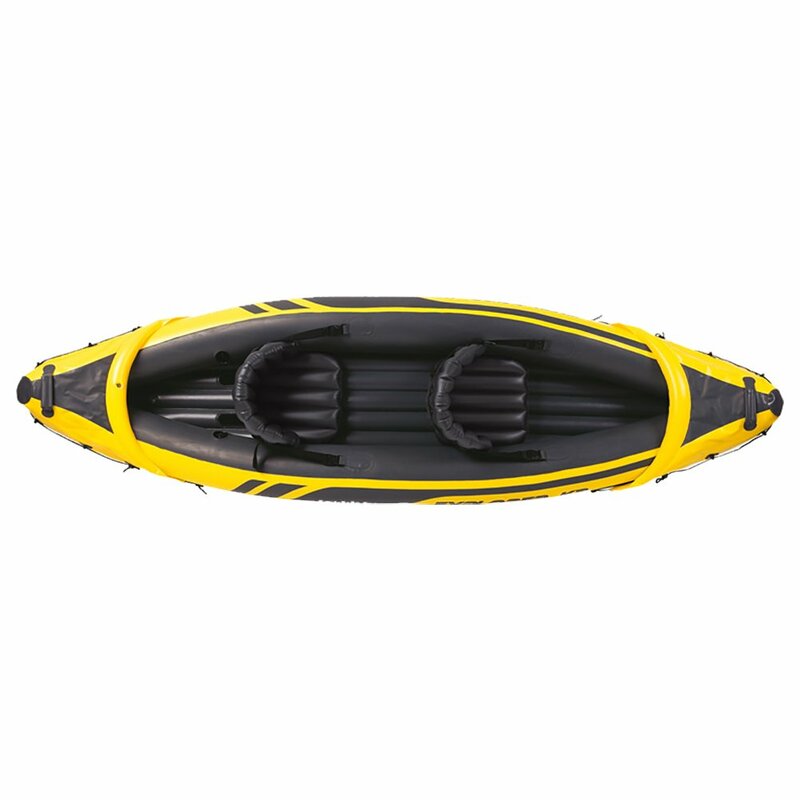 The Intex Explorer K2 kayak has two separate air chambers. The first air chamber is in the hull and the other is in the floor. The floor is reinforced with an I-beam construction. The reinforcing allows this kayak to carry a heavier cargo capacity while providing additional protection for the floor air chamber. 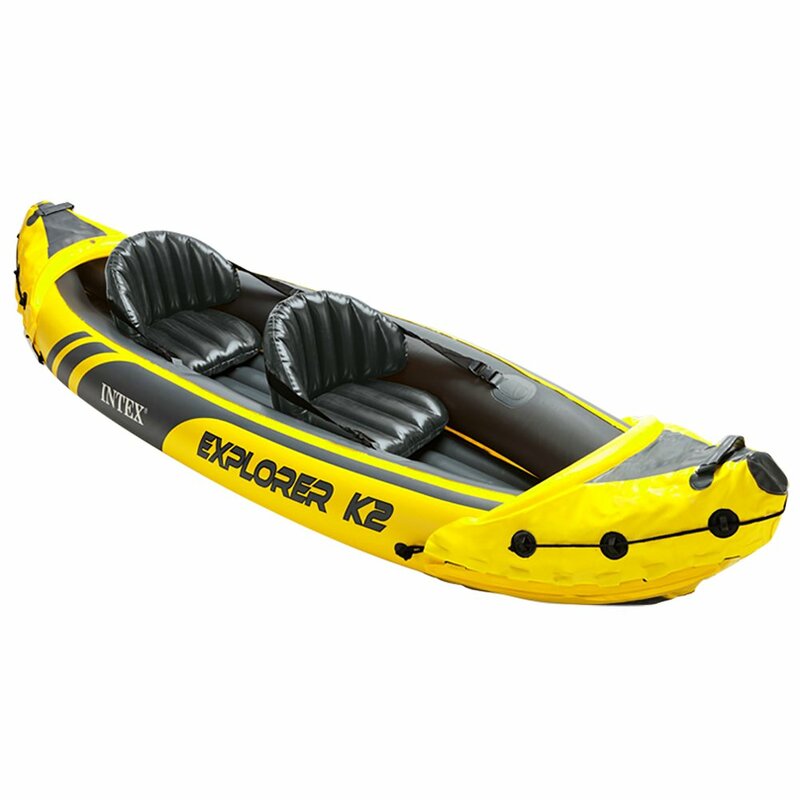 The construction of the two air chambers is such that if one is punctured, the Intex Explorer K2 kayak will remain buoyant. This will allow you to safely get to a location where you can use the patch kit. You should have no problem with getting back out on the water in under a half hour. The Intex Explorer K2 is a tandem kayak but it does not have to have two adults to handle it. You can paddle this kayak solo, should you choose to go out alone. You will need to put some of your gear in the kayak in front of you to help balance out the load. The kayak was designed for two people and the balancing point is farther forward than the rear seat. This is no problem at all since it does not take a lot of weight to balance it out. The Intex Explorer K2 is stable enough for you to take your dog with you. Neither the dog nor the kayak will tip over when riding in this kayak. The bottom is sturdy enough to withstand your dog’s claws without need to pull out the patch kit. While the Intex Explorer K2 is not strictly a fishing kayak, you can use it for fishing. There are no rod holders but there are plenty of ring connectors on this kayak to allow you rig some bungee loops for use as rod holders. Since the kayak rides very flat on the water, you can take it wherever the fish are biting, it’s as durable as the Malibu X Factor Kayak. If there is any drawback to the Intex Explorer K2, it is the black bottom. If this kayak is hit by direct sunlight, the bottom will heat up. If the kayak is left lying in the sun, there is the possibility that the black bottom will absorb enough heat to buckle. Owners of the Intex Explorer K2 who have experienced the buckling have stated that it did not impact the performance of the kayak. There were no leaks as the result of the buckling. Paddling was not adversely affected. The only real result was the kayak did not lie flat on the ground after it had buckled. There have been no reports of the Intex Explorer K2 buckling while on the water so it would seem this phenomenon is limited to when the owner leaves it laying in the sun while it is on dry land. Careful storage will avoid this problem.